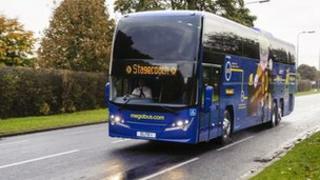 Bus passengers are set to benefit from new locator technology being fitted to Stagecoach buses. The trackers, on 7,000 vehicles, will make it possible to trace the progress of buses in real time from apps on smartphones and on the internet. The Perth-based transport firm said the system would be piloted by summer next year, and should be fully deployed in late 2015. The firm said passengers wanted certainty over when a bus would arrive. Robert Montgomery, managing director of Stagecoach UK Bus, said: "Investment in this new system will help deliver a platform to provide better journeys for our customers, more cost-effective information provision by local authorities, and improve the efficiency of our own operation."